Luke Donald and not Rory McIlroy will likely go to Augusta as world No 1 after the Englishman pulled off an impressive sudden-death victory at the Transitions Championship near Tampa. Donald gouged seven-iron out of the right rough, saw it bounced on the fringe and scoot up to six feet from where he duly rolled home the birdie on the first extra hole to beat Korean Sang-Moon Bae and Americans Robert Garrigus and Jim Furyk. Garrigus, who forced his way into extra time with closing 64, had a chance to make Donald putt to stay alive moments earlier but missed from seven feet. 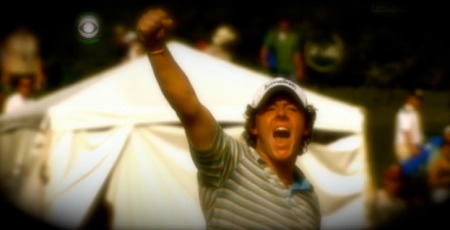 The tournament will be remembered for Donald’s victory, which halted McIlroy’s reign as world No 1 at just a fortnight. Not that McIlroy was that surprised. Winning tournaments is something that looks beyond Padraig Harrington right now after the Dubliner followed his opening 61 with rounds of 73, 72 and 71 to finish six shots outside the play-off in tied 20th. Harrington started the final round four shots adrift of overnight leaders Furyk and Retief Goosen but, on a day of good scoring with Scott Piercy’s 62 showing that a low round was possible, the Irishman failed to get any momentum and only mustered two birdies to go with two bogeys in his round. He birdied the third, holing a 17-footer, but bogeyed the 10th where he came up short in a greenside bunker with a wedge approach. Harrington bounced back with birdie on the Par 5 11th, sinking a 20 footer, but made another bogey on the 16th where he missed the green with his approach, chipped to 14 feet and missed the par putt. After his opening round course record 61, Harrington – without a win on the US Tour since his 2008 US PGA championship triumph – failed to carry the shot-making or putting of that first round with him for the rest of the tournament. In fact, he had more birdies in the first round (10) than he had the following three rounds (six) combined. That 61 was his only sub-par round. He problably still felt marginally better walking away from Copperhead than Ernie Els, who missed two four-foot putts in his last three holes, finishing bogey-bogey to miss out on a play-off by one. The man who hates to be called The Big Easy, closed with a 67 to finish tied fifth. But there is a bigger picture. Next week’s Arnold Palmer Invitational is the last chance to get into the top 50, and he’s likely in need of a victory there, too, to crack the top 50. Short of that, his only way into the Masters would be a win at the Shell Houston Open. 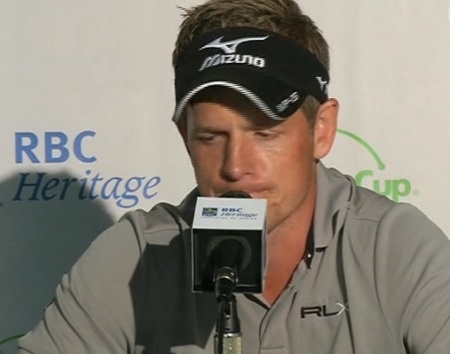 Els said the missed putt on 16 affected him on both his tee shot at the 17th hole and on the short putt on 18. After failing to convert the birdie putt, there was a long wait on the 17th tee, a difficult 218-yard par-3 where Els pushed his 4-iron to the right and was fortunate to have a shot to the green. He left himself a 25-footer for par, narrowly missed, then walked to the 18th tee tied for the lead. After a perfect drive, Els had just 160 left, but pulled his 7-iron approach just off the green. He hit a decent chip to 4 feet, then missed. This, obviously, was not the time to be asking questions, but Els consented, then signed autographs as he walked around the clubhouse and to the parking lot. There, the fire inside him having subsided somewhat, he lamented the missed opportunity. “When you’re on the hot seat, people are going to criticize you,” he said. 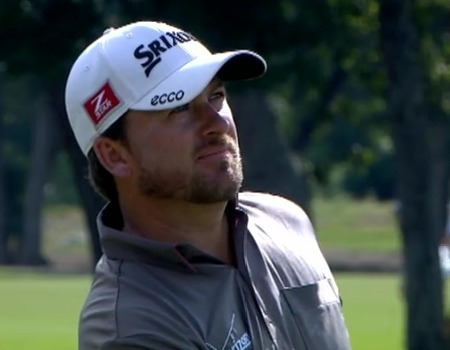 “When you hit a good putt and it misses, you’re still going to get criticized, you know? So that’s the position I’m in. If I hit a good putt, feel it’s a good putt and it doesn’t go in … doesn’t matter what I say. Els fell from 79th to 118th in the stats for putts holed from 3-5 feet following Sunday’s mishaps. Harrington has now missed 12 of the 58 putts from 3-5 feet he has faced this year and slipped from 150th to 164th for the same category. While McIlroy is down one place to second in the world, Harrington is down one to 91st. His 61 came just days ago yet it already seems like an age has passed. Rory McIlroy answered his critics in emphatic fashion when he closed with an incredible run of six successive threes to win the Quail Hollow Championship by four shots from Phil Mickelson - smashing the course record by two with a scintillating, bogey free 10 under par 62 to secure his maiden PGA Tour victory in grandstand fashion on 15 under par. The Holywood star, who does not turn 21 until Wednesday, became the youngest winner on the PGA Tour since world No 1 Tiger Woods claimed the Walt Disney World/Oldsmobile Classic aged 20 years, nine months and 20 days in 1996. 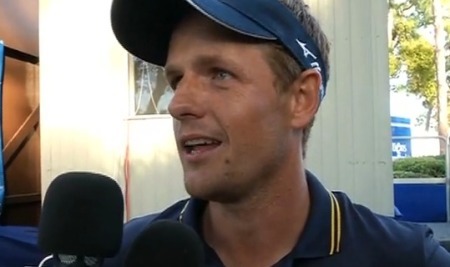 Luke Donald must finish in the top eight in the RBC Heritage to retain his world No 1 ranking ahead of Rory McIlroy.Luke Donald is in danger of losing his world No 1 ranking to Rory McIlroy again after opening with a disappointing four over par 75 in the RBC Heritage at a windy Harbour Town Golf Links. 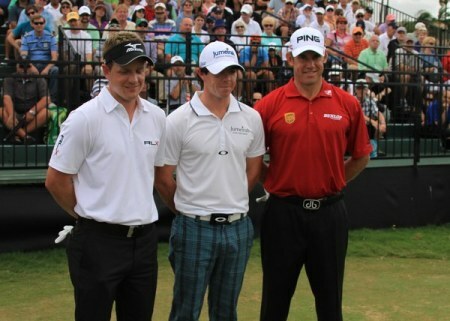 Luke Donald, Rory McIlroy and Lee Westwood at Doral this year. Photo Eoin Clarke/www.golffile.ie Rory McIlroy will regain the world No 1 ranking from Luke Donald tomorrow after the Englishman failed to clinch a top-eight finish at the RBC Heritage in South Carolina. Graeme McDowell watches his approach to the 15th in the second round of the Zurich Classic of New OrelansGraeme McDowell made the cut on the limit after a disappointing 73 as Luke Donald kept alive his chances of regaining the world No 1 ranking from Rory McIlroy in the Zurich Classic of New Orleans. The Englishman must finish solo seventh at worst to go back to No 1 and he took a step in the right direction when he bounced back from an opening 73 with a faultless seven under par 65 to climb 80 places to tied 22nd at halfway. The game of musical chairs that is the battle for the number one spot in the Official World Golf Ranking continued in the Zurich Classic of New Orleans when Luke Donald finished third to return to the summit of the game for the third time in his career.Luke Donald clinched an impressive third place finish in the Zurich Classic of New Orleans to overtake Rory McIlroy and go to world No 1 for the third time in less than a year.